In the United States, September 27 is the National Corned Beef Hash Day. This food related holiday is dedicated to a well-known dish that became especially popular in some countries during and after the Second World War and has recently made a comeback. The term “hash” is derived from the French word “hacher” which means “to chop”. Hash consists of chopped or diced meat, potatoes, and spices. 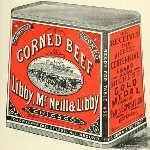 Corned beef hash became popular because during and immediately after WWII fresh meat was rationed while corned meat was widely available. Later hash became a popular breakfast food, often made of leftover meat. As a breakfast food, it is usually served with toast, fried eggs, and occasionally some kind of fried potatoes. To celebrate the National Corned Beef Hash Day, cook this dish for breakfast. Cook two large potatoes and cut into cubes. In a large skillet, heat 2 tbs butter and 2 tbs olive oil. Add potatoes and cook until golden and crusty all over, occasionally turning them over with a spatula. Chop 1 large onion and mince 2 garlic cloves, add to the skillet and saute for 5 minutes. Add 1 red and 1 green pepper (cubed) and cook 2 more minutes. Finally, add 12 ounce cubed corned beef and cook for 10 minutes, flipping hash over every 2 minutes to ensure it is crusty all over. Serve with fried sunny-side-up eggs.